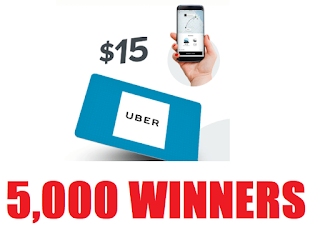 Uber $15 Gift Card Instant Win Giveaway - 5,000 Winners. Daily Entry, Ends 12/28/18. Short ten day entry period, 500 winners per day so we should have a nice amount of winners from here. GOOD LUCK!! 5,000 GRAND PRIZES: A $15 Uber Gift Card, fulfilled as a digital code, terms and conditions apply. Approximate Retail Value (“ARV”): $15.